Being frugal is just in my nature, so I'm wanting to use anything I might have on hand instead of buying new. 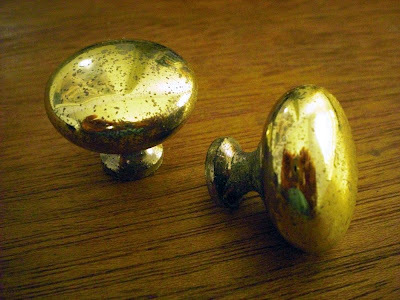 Many of us have these brass knobs and mine are in pretty sad shape. Shiny brass hardware of any kind isn't my thing...it reminds me of the 80's. Is it just me? 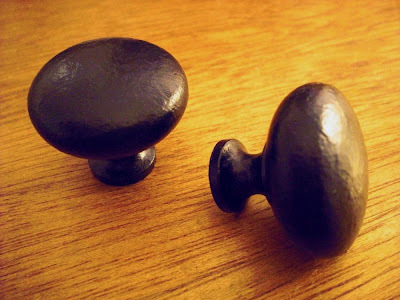 When I found brushed steel knobs on sale for $0.75, I immediately changed out the brass knobs in my kitchen. With the switch, all of this extra hardware was just sitting around waiting to be used (: I couldn't pass up the chance to transform these little guys into something better. The solution? Why paint and Mod Podge of course! I simply applied 3 coats of black acrylic paint in a dabbing motion to give an iron or hammered texture...nothing too severe, just something subtle. Then three coats of Mod Podge to seal the deal (: If you're trying this, make sure to add a little water to your brush during the Mod Podge application so it won't leave any brush strokes behind. If you want this to be permanent I suggest a base coat of Kilz primer first. 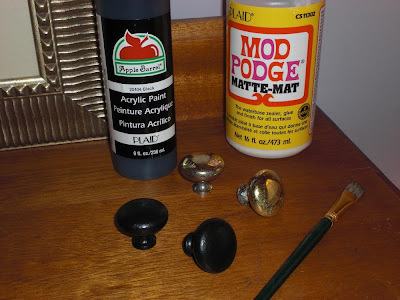 Then after the Mod Podge phase, use a sealer of some sort. The reason I'm skipping these two steps is because the brass knobs belong to the apartment I'm renting. 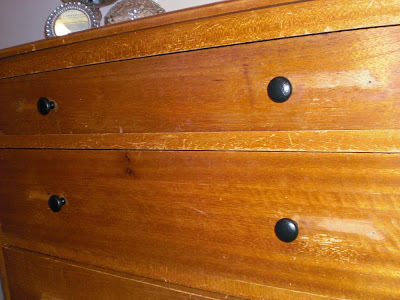 When I leave, the knobs stay. After a few days of soaking in hot soapy water, the paint comes right off, yet it's strong enough for everyday wear and tear. Pretty neat, huh? 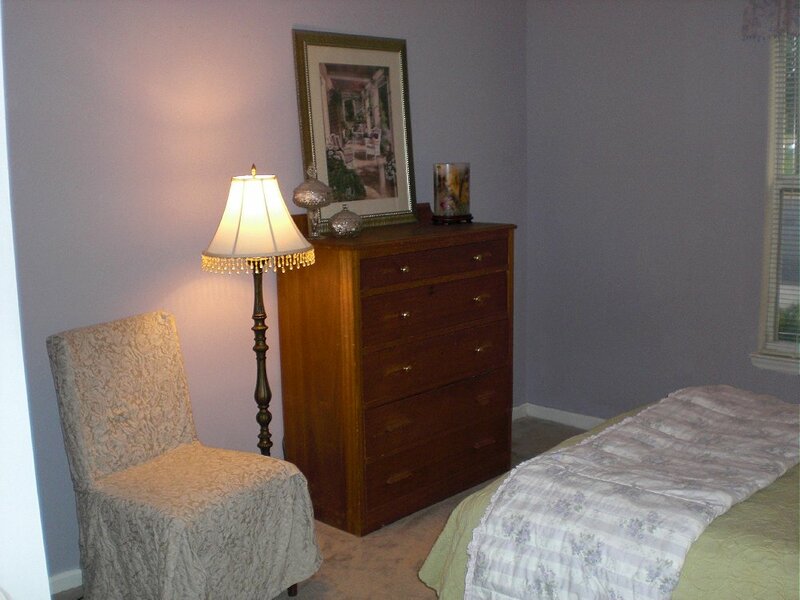 I did this in my previous apartment with great results! 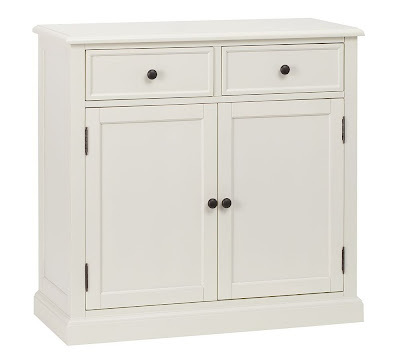 Here's my sweet dresser sporting her lovely new "iron" knobs. She's a little distressed from the many years of use, but her coat of white will be completed soon enough (: Don't forget to stop by on Makeover Monday for the final results! If you're wanting to change your hardware but don't have the funds, get frugal and grab your paint brush! Great results are only a few cents away!! 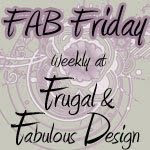 Linking up with Frugal and Fabulous Design...stop by and see more great ideas!